Council surveyed 2500 of the region's residents from May 2016 to February 2017 as part of a review of its Community Strategic Plan. Respondents rated an Indoor Pool or Aquatic Centre as their second highest rated priority project. To understand the viability of such a project, from both an economic and social consideration, Council has contracted expertise to assist with an Indoor Pool Feasibility Study. Undertake an assessment of the current market and the latent market if an indoor all year-round pool or pools were built. To review the current Mudgee pool site, conduct a site analysis and identify the most suitable site for the facility and the possibility of the integration of a proposed indoor facility. The study is to include alternative options with a clear conclusion on the financial implications of building and operating an indoor pool. The consultant’s report is to outline all assumptions, data, options and costs. The study is to include an assessment of the current venue designs and functionality and provide a guide for the future development and refurbishment of the Aquatic Facilities. A final report with findings is expected to be provided to Council in June/July. 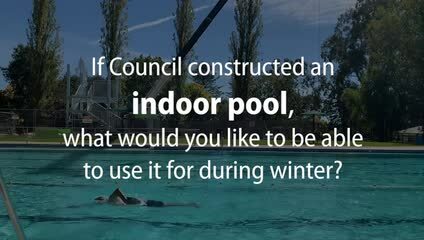 As part of the Indoor Pool Feasibility Study, Council would like to understand what you would use the facility for during winter months. Would you be interested in being involved in further consultation activities for this project? If so, please provide your email address below. Is Mudgee the only location being considered? When will the findings be released? What are RMP and Associates doing?